For a new graduate student in mathematics, the easy part is mastering equivariant K-theory or the geometry of quiver varieties. But navigating the transition from learning to doing research is another story. “That’s the most basic and difficult part, because there’s no standard way to do it,” says Victor Ginzburg, Professor in Mathematics and the College. Ginzburg began helping graduate students in mathematics make that transition at the University nearly a decade ago. His mentoring skills have now earned him a 2006 Faculty Award for Excellence in Graduate Teaching. “The main point in math is to find a problem,” Ginzburg says. But finding the right problem often poses a major problem in itself, as he learned from one of his own professors, Israel Gelfand. Six graduate students currently work under Ginzburg’s supervision, not counting the two who just completed their Ph.D. requirements this quarter. Ginzburg considers it his responsibility to find them their first jobs. His first students have progressed nicely beyond their postdoctoral assignments. Vladimir Baranovsky, who received his Ph.D. in 2000, has just received tenure at the University of California, Irving. Wee Liang Gan completed his Ph.D. in 2003 and has landed a tenure-track position at the University of California, Riverside. Ginzburg originally intended to become a nuclear physicist. But as a Jewish student, he found his career path barred by anti-Semitism in the former Soviet Union. “I didn’t realize it at the time, but no Jew was allowed to do that, and so I was just kicked out,” he says. He switched to mathematics, earning his Ph.D. at Moscow State University in 1985. Moscow State once commanded world attention as a center of mathematics scholarship. But today, following the exodus of Gelfand and many others over the last two decades, “basically there is no mathematics left,” he says. The former chief researcher at the Schmid Institute of Physics and the Earth at the USSR Academy of Sciences, Ginzburg joined the Chicago faculty in 1994. He also had been a visiting professor at Harvard University and at the Institute for Advanced Study in Princeton, N.J.
Two other Moscow State alumni who followed Ginzburg to Chicago are Vladimir Drinfeld, the Harry Pratt Judson Distinguished Service Professor in Mathematics and the College, and Alexander Beilinson, the David and Mary Winton Green University Professor in Mathematics and the College. The migration of mathematicians from the former Soviet Union has even influenced mathematics terminology in his own specialty, representation theory. Long known as Lie theory in the West, it was called representation theory in the former Soviet Union. “Now everybody calls it representation theory,” Ginzburg says. Representation theory is an abstract branch of mathematics that defies translation into lay terms. “You cannot come and sit at a seminar and understand unless you really know the subject,” he says. 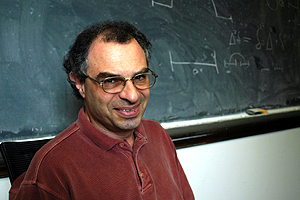 Ginzburg teaches three graduate courses each year, including representation theory and many other titles. But sometimes he disregards the boundaries of his syllabus when he has something exciting to share from another specialty. Ginzburg says working with students on day-to-day issues energizes him. “Even my wife notices this,” he says.